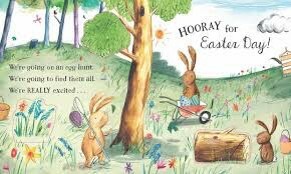 Join the Easter Bunnies on their lift-the-flap egg hunt. A super interactive book with counting at its heart. Is there a surprise in store? The new teacher assessment frameworks for writing place an emphasis on children writing for a range of purposes and audience. Do children have a visual prompt of their audience? For example of they are writing a ‘Get Well’ card to Teddy, is Teddy on the writing table with a bandage on his arm? At EYFS, writing tasks work best if children can relate to the experience (concrete rather than abstract). Teachers should use the language ‘Who’ are we writing to and ‘Why’ are we writing rather than purpose and audience. KS1 children will benefit from role play; hot-seating; using props and oral rehearsal. They may also need ‘Who’ and ‘Why’ before the terms ‘Audience & Purpose’ are introduced. Make ‘Audience & Purpose’ explicit. What does it remind us of? : If the children have read ‘We’re going on a bear hunt,’ they should recognise the similarities in the organisation of the book. Look at the books side-by-side and talk about this. 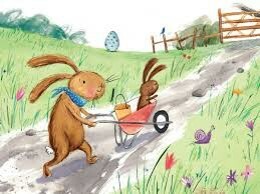 ‘Really reading each page’:This book includes very rich illustrations that could be explored and inference probed – first page – why is the baby bunny in the wheelbarrow? Why are they carrying nets and baskets?. Lift-the flaps: use long rolls of paper (wall paper) to create on version of finding 10 eggs. 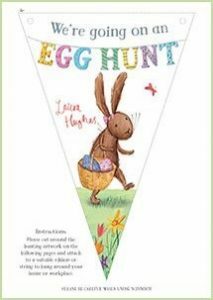 Children stick egg shaped flaps on and write numbers underneath. 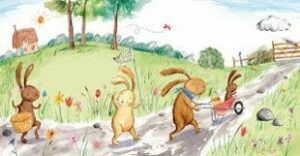 Lift-the-flaps: throughout the book, the bunnies encounter problems (bees, chicks etc…) Same activity as above children create flaps for more problems. Messages: using the page where they meet Wolf, instead of running away, what could the bunnies say to him? Write messages for Wolf. I’m sorry: teacher writes a sorry letter from wolf to the bunnies – children can write their own sorry letters from wolf. Invitation: in response to the ‘sorry letter,’ children could create an invitation to the bunnies house for wolf. Whole class: scan the book in to show on interactive board – children could join in with the words and perform with actions – ‘oh, no, bees (buzz around the stage). This could be shared in an assembly. Chatterbox: children choose a section to photograph and record some speech for the characters to say. Invent a new verse: revisit the problems the bunnies encounter. Can we make our ‘Oh no – ____’ verse? What other problems might the bunnies face? Create more verses and record. Design an egg: egg template to design. Play dough: making eggs with play dough and decorating with pipe cleaners, feathers etc. Egg Hunt: making signs and labels encouraging others to come to the EYFY Egg Hunt! 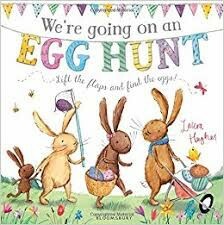 Organise your own EYFS Egg Hunt! Lots of eggs to eat! This entry was posted in Easter 2018. Bookmark the permalink.